Our European ancestors really had it in for cats, chiefly because of their association with the devil or witchcraft. Many cats have paid the ultimate price for this superstition. 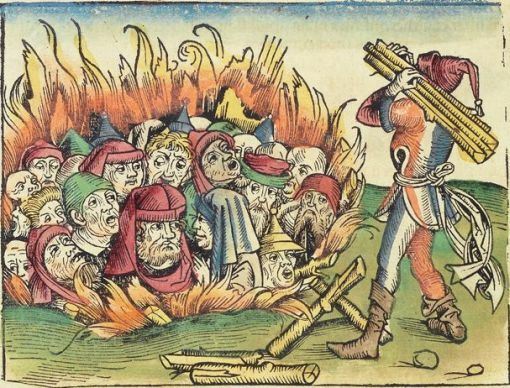 Documents from medieval and early modern Europe describe dozens of cases of cats being burned alive, either for entertainment or religious point scoring. Cat burning was particularly common in France, where a dozen live cats were routinely torched in Paris every Midsummer’s Day (late June). English courtier Philip Sidney attended one of these feline infernos in 1572. In his chronicle, Sidney noted that King Charles IX also threw a live fox onto the fire, for added interest. In 1648 France’s King Louis XIV, then aged just 10, lit the tinder on a large bonfire in central Paris, then watched and danced with glee as a basket of stray cats was lowered into the flames. Live cats were frequently burned alive elsewhere in Europe, particularly at Easter or the period around Halloween. According to Charles Hatton, these perverse celebrations were concluded with the opening and distribution of a free barrel of claret. 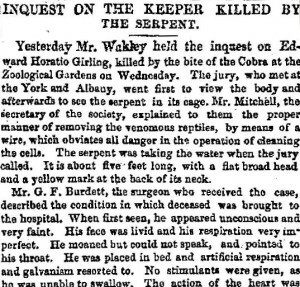 In October 1852 Edward Horatio Girling, an employee at London Zoo, died after being bitten by a five-foot cobra. 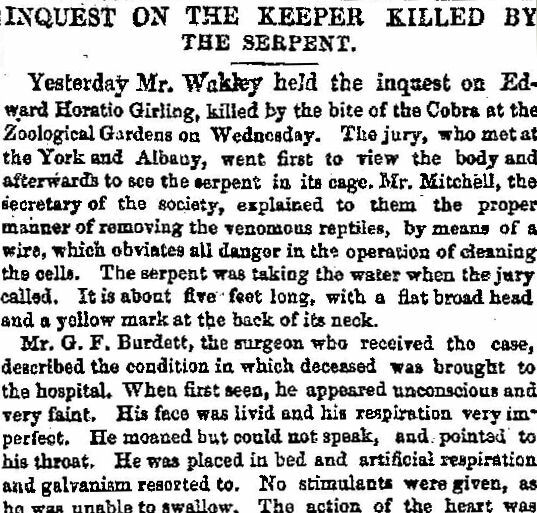 A post mortem on Girling’s corpse showed the cobra had bitten him five times on the nose. One of these bites had penetrated to the nasal bone and bled profusely. Girling was rushed to hospital by cab, a journey that took 20 minutes. While in the cab his head swelled to “an enormous size” and his face turned black. In the hospital, Girling was given artificial respiration and electrical shocks. Neither was successful and he died 35 minutes after arrival. Stewart and other witnesses also testified that Girling had been seen drinking ample quantities of gin at breakfast time. A zookeeper named Baker told the inquest “he believed that the deceased was intoxicated”. It was also noted that Girling had little if any experience with venomous snakes. A supervisor noted that Girling had only recently started working at the zoo after employment with the railways. Unsurprisingly, the coroner found that Girling had died as a “result of his own rashness whilst in a state of intoxication”. The fate of the fatal cobra was not recorded for posterity.